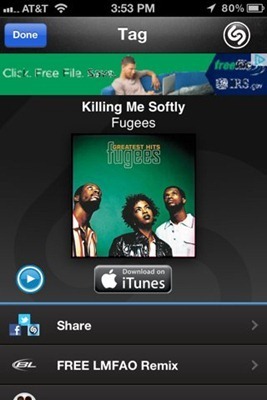 Shazam for iPhone, the excellent song identifier app, has been updated today – to Version 5.0.0. That second item has been on my wish list for a long time. In fact, I wrote a post about it back in late 2009. I am happy to see the developers clearly saw that and thought ‘lets get right on that’. I think it’s a great change – there’s nothing else I want Shazam doing whenever I open it. As for the quicker start-up time and ‘lightning fast tagging and recognition, I did a quick bit of testing with Shazam 5 and the current version of SoundHound (4.4.1) and found they’re both pretty speedy. Shazam was maybe half a second quicker in opening and being ready to start tagging. It was also a little quicker on 8 out of 10 songs I asked both apps to identify. Hardly a major study, but it does look like Shazam is performing quite well. Shazam was one of the first real ‘wow factor’ native iPhone apps (a little less so if you were jailbroken and had used Erica Sadun’s Listen app that did the same). It’s good to see it still getting significant updates. Here’s an App Store link for Shazam; it’s a free, ad –supported app.